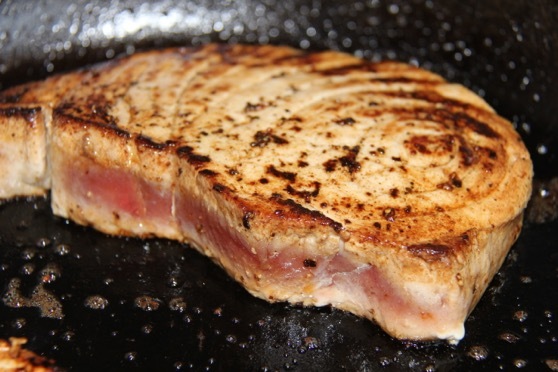 For the evening’s dining I had brought along a bottle of red wine, for this is what a dish of grilled marlin demands. The wine was from L’Avenir, the Grand Vin Pinotage from the 2006 vintage and I was already salivating at the thought of the perfumed red elixir chasing the oily, robustly flavoured morsels of marlin when the waitress made things even better. Inquiring about the corkage fee, sprightly Jessica informed me that the house policy is to only charge corkage from the second bottle one brings for dining. 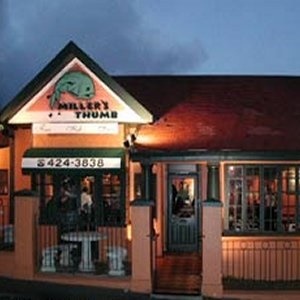 Now that is hospitality: No wonder Miller’s Thumb has been around for 23 years while the general rule for Cape Town eateries is to sustain a life-span as long as the sexual maturity of the Lesser Ruled Dragonfly. I ordered a Neil Ellis Groenekloof Sauvignon Blanc 2017 to kick-off proceedings, which began with me valiantly offering my translation services to help another waitress figure out what an elderly French couple were trying to order from her. After doing the ordering for them, as well as discussing the latest French club rugby scores and listening to the gentleman’s joke about Mrs Macron’s fashion choices, I returned to my table where the starters were waiting. My blue-cheese salad was crisp and dew-drop fresh. Carrots, lettuce, onion and tomato lay beneath a creamy, sturdily flavoured dressing made from real cheese instead of having been poured from the Ina Paarman bottle. Other starters supped on included baby calamari tubes as tender as the tongue of a new-born rabbit and one deliciously gamey spread of Springbok carpaccio. The Miller’s Thumb does do meat, such as an espetada, that inverted kebab made famous on the island of Madeira, and this one is large enough to fend-off a tribe of assegai-donning Zulus with land claim on the mind. There is steak, too, like the fish grilled to perfection by Solly. 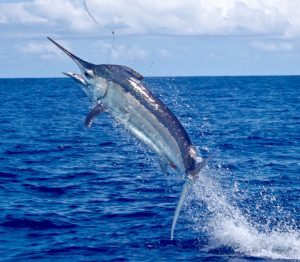 But I had marlin on the mind, which was included on the daily chalkboard specials along with other delicious ocean creatures whose deep-sea swimming had been somewhat rudely interrupted by net and line. Other fresh fish available included kingklip, tuna, angel-fish and dorado, the latter also known as the chicken of the sea, just without the fish-meal flavour and listeriosis issue. One can select your fish of choice grilled with lemon butter or spicy Cajun, my preference always leaning towards the former. When it comes to fine fresh fish, the simpler the better and just salted butter is fine, too. My black marlin came to the table looking like a gift sent to me by one of Neptune’s favourite and still unblemished mermaids. The piece of flesh the size of a paper-back novel bore light, golden-brown stripes from the grilling process, but the hue was predominantly pale gold in a Cornish clotted-cream sort of way. It was served with chips that, well, could have been crisper and more accurately cooked. But I only had eyes for the fish. Despite its brutish appearance and furious displeasure when finding itself hooked at the end of a fishing-line, black marlin is one of the most delicately flavoured fishes in the see. The flesh does not flake, rather giving way under the first cut of a knife. Then you are presented with soft, saline ocean-flavours that reminds one of abalone and fresh sweet lobster. It is a most delicious fish, and each and every morsel was eaten with gusto and respect for the magnificent creature who had sacrificed his life for the important benefit of man’s culinary pleasure. The dorado was similar in appearance, with a meatier texture and a slightly more fish-like flavour. Game-fish and Pinotage are the perfect match. Just as Ernest Hemingway is inseparable from short sentences, boxing gloves and serial marrying, so a steak of marlin finds its match with Pinotage. The L’Avenir must be one of the finest examples around, the velvety, red-fruit notes and the mouth-loving texture making the fish swim again, this time through a sea of gorgeously graceful wine flavours. I was loving the wine too much to think of dessert, but there was a lot of ice-cream and pecan-nut pie going on around me that looked decadently tasty and immensely satisfying. My mind was still on the fish, thoughts of deep blue waters and savage death after the battle between man and creature. And you can taste thoughts, too. Yum! I need to go eat there, I’ve always wondered about the restaurant – if it comes with your approval it must be good. It is a step-up from Dias Tavern, very nice. We’ll go there once new bambino has arrived.